The following is a reconstruction of an early Christian morning prayer service (Prime) gleaned from the Apostolic Constitutions. I have added the singing of hymns to make the service more fully functional and inclusive of the congregation. The prescribed prayers could, if the presbyter prefers, be replaced with the offering of personal prayer. Prime should ideally be observed during the First Hour; that is, 6 a.m. 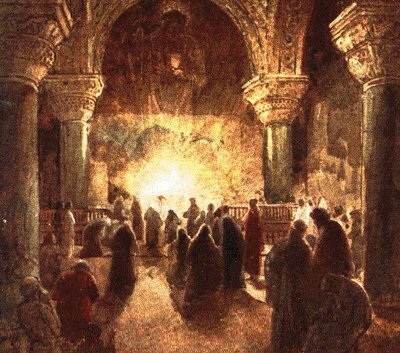 However, it may be observed as late as 8 a.m. At the beginning of Prime (Morning Prayer), everyone shall read the Psalm at the presbyters prompting; the candles being lit upon the Holy Table and incense burning. The presbyter then begins the service with the recitation of the following Psalm. Presbyter: Glory be to God in the highest; and upon earth, peace and goodwill among men. We praise you, we sing to you, we bless you, we glorify you, and we worship you, through Jesus Christ; you who are the true God, the one God, the Almighty. Hear our prayers, you who are enthroned above the Cherubim and who takes away the sins of the world. You we worship, Heavenly Father, together with Jesus our Savior, and the Holy Spirit, forever. Amen. Presbyter: Heavenly Father, Creator of the universe, who has given the sun to rule over day, and the moon and stars to rule over the night; we ask you to look upon us with eyes of mercy, and be blessed in our morning thanksgiving; for we do not accept false gods, but stretch out our hands to you alone, the Eternal God; who has given us Life through Christ, and our well-being through Him. May all glory, and honor and worship be to you, through Him, and to the Holy Spirit, forever. Amen. Deacon: Let us kneel, bowing our heads for the blessing.